Oh my stars! The AVR-3806 has arrived! 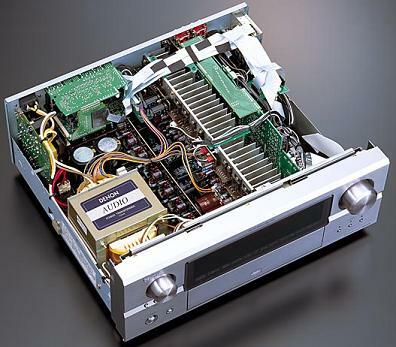 we make no secret that we loved the 3805, it was the stores go-to amp; it sounded beautiful and worked brilliantly. The 3806 has some big shoes to fill, so read on to discover how it fills them. The hot feature at the moemnt is HDMI and the AVR3806 brings that to the party, a first at this price point. NOt only does it feature two inputs for switching, but it also offers up sampling from analog video inputs, giving you a single connection to your display. For those of you running a flat panel and a projector, then you can take advantage of its dual component video outputs. Full room correction is also available via the excellent Audessey MultEQ system. Calibrate your environment with a full multi point audio calibration system with the supplied microphone (a beefy little number from Audio Technica). This system works a treat, the difference in sound is quite startling. A raft of other improvements include selectable user modes and a greatly improved EL remote. All of this backed up by Denons usual ease of use. But the proof is ofcourse in the listening, so pop in with some of your favourite discs for a demo!